Present in Romania for the first official PADI Member Forum, Michael Elbeshausen, PADI Regional Manager for Northern Germany and Eastern Europe (Bulgaria, Czech Republic, Hungary, Romania, Slovakia) spared some of his time and sat down with MyDive.ro to talk about the Romanian scuba market, the PADI Member Forum and what future events are in the workings for Romanian divers. There is potential, I’m absolutely sure! Now we are in the very beginning, because this is a market with one dive center and less than 100 members. So there is a potential to grow, of course, and the first step is to physically show up in this country on a regular basis and to run Member Fora in Romania each year. Translations for manuals will come later; we need more members, of course, before we can invest and see a realistic return of investment (ROI). Why would a student or dive center choose PADI? This is quite easy to explain. There are some innovations on the market which you want to grab and push forward, such as the Open Water Diver Touch (OWT) – a way of learning the academics of scuba diving on a tablet – nobody else has such a program right now, to run the theory on an iPad, completely digital, so this is one part. On the other side, if you see on Facebook 695,000 Likes, we are quite active compared to the competition with less than 30,000 Likes or 9,000 Likes. This doesn’t make a good diving organization, but there’s traffic in the social media and everybody can see us, so we are physically and virtually over there by the members. 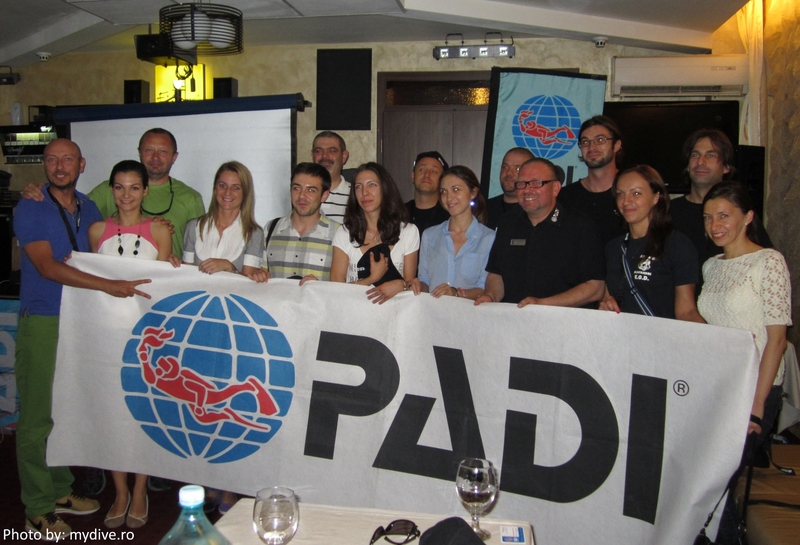 The main target group for PADI is the 20-30 year old non-divers. And the average Facebook user is about 28-29 years of age, spending many hours per day on social media platforms. We, as PADI, want to meet and pick-up the potential customer where she/he is… and this is, for example, Facebook. In the past years PADI has changed significantly the tools made available for students and dive centers, keeping pace with the technologies. Why is that so important? Well, we count on social media, but diving will always run in the pool, so it will never step out of the water, but we have to meet the people where they are and they spend many hours per day on Facebook and in social media and this is the platform where we can easily spread the word and reach all interested. I prefer to call them, as I told you, the Homo sapiens who are not a “Homo aquaticus” yet, so they start with the DSD and intro dives and those guys, millions, are to be found on those platforms. That’s why we concentrate on social media. Anyway, learning to dive is something physical and this process happens in the water and nobody can change that, thank God. It’s like that and I’m happy about it. We saw that the PADI marketing team is offering funding to different PADI dive centers and resorts for new diver acquisition activities. Is this a new approach or has PADI offered such support before? Well, this new diver acquisition activity fund, as well call it, is a new approach. At PADI EMEA we have the MarCom Department – Marketing and Communication Department – run by Paula Wantke and Sylvia Ross, and they’re doing a great job with a team of ten hats, e-marketing specialists and so on, and this is a new idea, especially the “ASK ANY DIVER” campaign which has the goal to produce videos from divers and diving PROs to inform the public and anyone interested in scuba diving, with a short clip of one and a half-two minutes, about being a Divemaster, becoming an Instructor, being an Advanced Diver and what is diving all about. And there is another part that we do, that we pay basically an entry level advertising acquisition tool, this is brand new, this is an idea from the managers of the marketing department and the crew and this baby was born, it’s a half a year old more or less. You can see it on Facebook on PADI Pros Europe. Yes, the first official and the second one… The one last year happened spontaneously, Adrian Bercea, the owner of BDODS Diving School in Bucharest caught me driving through the Carpathians Mountains, I got a call, he informed as many PADI members as he was able to get in that short period of time and we simply did it. I got some complaints from some of the members, “Oh, you should have called us…”. But it happened in 24h and spontaneous. I have been asked then by BDODS, our only diving center in Romania so far, to run a meeting in this wonderful hotel, Hotel Jolly Fun in Bucharest, that’s why we are here again, we announced it, but we didn’t reach all Romanian members, definitely we have to do it better with sending out the emails, but our members have to check their email account as well, if the email address is still valid or not… so that we can reach all of our Romanian PADI members basically. So, to eat a sausage, let me say it metaphorically like that, to eat a sausage from both ends and be successful in the very end. How do you feel about this year’s event? Were the targets accomplished? More divers participated? Yes, wonderful! I’ve got sixteen members over here, they are not only divers but PADI members, PADI Divemasters, Instructors and so on, and out of a pool of less than 100 PADI members in Romania so far, I assume 30 are working abroad anyway, so they are on a liveaboard in the Maldives and in Egypt, but still listed in their mother country, Romania, so they’re not in the country presently. And to reach an amount of 16, I’m very proud of that! It is a promising start. Yes, and we don’t want to exclude anyone, but a PADI Member Forum addresses PADI members, so PADI professionals starting from PADI Divemaster ranking and above. We are basically open to everyone, so if they love diving and PADI they are all very welcome and there will be special events for all divers together with BDODS in the future. We are in the negotiation and planning phase presently, I can tell you a little bit about this, we spoke about it yesterday [June 13th, 2013], business-wise: we want to run an event with manufacturers of the diving industry in this country, make something together with other diving organizations and producers of scuba diving equipment, we have to figure that out, and then all divers will be invited and all PADI members and other professionals as well. So just to place a diving event in this country to show the public what scuba diving is all about and invite them to an information day or two-three days in a row. Yeah, today [June 14th, 2013] we have been in the Parliament in Bucharest and I’ve seen the big conference rooms over there and probably we could rent one of those rooms or run the event over there and invite everybody who likes diving. Why is PADI going on tour? Basically this is an idea from Sylvia Ross, our marketing manager who joined the company in May 2010 and she had the brilliant idea to run “PADI ON TOUR”. And we started with events in Europe, in Munich, Hamburg, Amsterdam and Rome and many other big cities in Europe. We rented a hotel room and invited all PADI members, for instance, in Hamburg, Northern Germany, and we brought some manufacturers to this event and we ran this “PADI ON TOUR” event directly in a hotel. 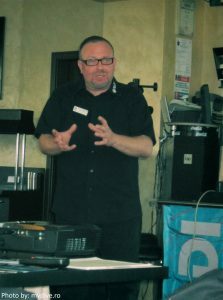 And this changed in 2011, because everything we do when travelling to our clients is called “PADI ON TOUR” and especially the regional managers and the managers themselves are touring as well, so the managers are not sitting in the ivory tower and don’t move, they move out to the clients every week. While we both are talking, our marketing manager, Sylvia Ross, is busy in Spain running a business academy over there in Bilbao and in other Spanish cities, while I’m here in Bucharest running a member forum. This you can multiply with several PADI Managers and Regional Managers, so you see, “PADI ON TOUR” is when we move, when we go to the clients, go to the business partners and run events over there at location. And you’re doing this once per year? The Member forum is once per year, but, to be honest, the tour is every weekend in the summer I have to say because, as I told you, my 3m by 3m pavilion PADI branded is my steady companion, always in the car. And then we will be at the lake because our clients, doesn’t matter if business partners or divers, spend their time at weekends where water is to be found, from Friday to Sunday, and so I concentrate on the weekends and visit a few dive centers during the week as well. Compared to last year’s agenda I didn’t hear anything about the TecRec, so about the technical part… Is this a new approach, leaving this aside and focusing on new things? We are still focusing on this niche market, we have the Tec 40, Tec 45, Tec 50 and the Trimix, so we are following that way, we have good contacts with manufacturers of rebreathers, in Europe, and what’s going on over there. The common interest in our TecRec programs in Romania and South-Eastern and Eastern Europe I’ll find out quite fast, but well, it’s a niche market still. We know that this is not a real fast growing community like recreational diving, but we love that and we offer programs for that and we work together with some brands that are active in technical diving. And we focus on that, but basically we are a recreational diving organization and concentrate mainly on developing scuba diving programs in all terms. Of course, there are some professionals at PADI, like Divemasters and Instructors, who want to know more on how to reach their limits, so they want to go deeper, stay in depths a bit longer than possible on simple air. They want to use gas mixtures and so on and we want to feed that market as well. This is a self-feeding system in the meanwhile and nobody has to push the market as strong as we all did many years ago, because this is the specialty number one with a distance… Imagine you are in Egypt on a dive boat in a liveaboard and Nitrox for free is being offered to all trained Enriched Air Divers, and you will be the only one out of 20 people on the boat not being trained and licensed in diving Nitrox. 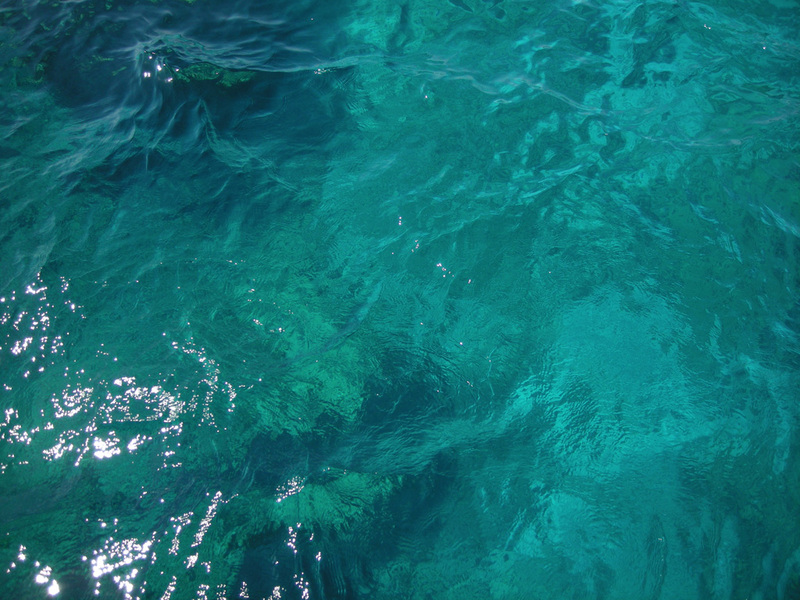 And all other divers on the boat can make use of Enriched Air gas mixtures during the dive. What a pity then;)!